Taiwan President Ma Ying-jeou honored Evergreen Group founder Dr. Chang Yung-Fa with a posthumous commendation in recognition of his contributions to international transportation and social welfare during the memorial service today. 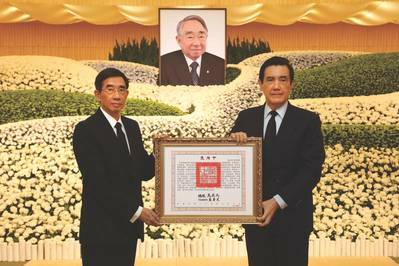 The company's North America headquarters are in Jersey City, N.J.
Taiwan's Education Minister and the Minister of Transportation and Communications also offered homage to Dr. Chang with the First-Class Professional Education Medal and First-Class Professional Transportation Medal. Evergreen Group is holding the memorial services for Dr. Chang at the Chang Yung-Fa Foundation in Taipei through February 5. Thousands of mourners are coming from around the world to pay respects to Dr. Chang, including his close friends, government officials, representatives from business partners, shipping industry, aviation and travel trade in addition to Evergreen Group's local employees and delegates from its overseas affiliates. Many more attending are those who have benefitted from Dr. Chang's charitable work and generosity. Dr. Chang established Evergreen Marine Corporation in 1968. The global container carrier's service network facilitated exports from East Asia and especially for Taiwan, an island that relies on foreign trade for economic development. The shipping line's unprecedented success in launching Asia - Europe service opened the door to the booming European market for exporters in Taiwan and many parts of Asia. Dr. Chang formed EVA Air in 1989. The airline's innovative service has attracted international passengers and driven the growth of Taiwan's travel industry. Now a Star Alliance member, the airline has won numerous awards for service excellence and flight safety from aviation and travel organizations. Its consistent recognition has helped promote Taiwan's image in the global community. Evergreen Group has also diversified into aircraft maintenance, engine overhaul and manufacturing of aircraft parts, playing an important role in building Taiwan's burgeoning aviation supply chain. With its business expansion, Evergreen Group has established overseas affiliates across a global network of more than 110 countries. These investments have driven growth and development for numerous related industries, including container shipping, aviation and hotels, etc. Evergreen's steady growth over the past few decades has also enhanced Taiwan's economic exchanges with other countries and paved the way for bilateral relations. The honors now being bestowed on Dr. Chang posthumously are added to the accolades that he received over the course of his career from many countries across the globe, including the U.S., Panama, Japan, Malaysia, the U.K., France, Germany, Italy, Belgium and the Netherlands.